Torbay’s Most Luxurious Retreat Day Spa. At Torbay’s most luxurious retreat day spa,Vspa Retreat, you will experience an unrivalled personal service from the moment that you enter to the moment you leave. Our exclusive and luxury skincare ranges have been carefully selected for their outstanding results. Vspa highly qualified Spa Therapists will make your visit memorable and leave you looking forward to your next visit. All our therapists are intensively passionate about individuals well being and customer care. The therapists are all VTCT qualified level 2 and 3 and City and Guilds qualified and Spa trained and they are all trained to Vspa Standards, as well as Vspa Spa Rituals and Highly trained in Customer Service. Re-discover your senses…..rest your mind…..and let us pamper your body and soul. Whether you wish to de-stress, indulge or detox, a myriad of suggestions lie in the Treatment Menu. Choose from holistic therapies, beauty treatments or a combination of the two. Should you need any guidance, we offer a helpful complimentary pre-treatment consultation service. The spa has been setup as an ultimate chill out day spa. There are no wet facilities. You will find a relaxing atmosphere as well as effective treatments for beauty and well-being. We have two couple’s treatment rooms where two people can enjoy a treatment together simultaneously. Each treatment room is cosy, and some have heated massage couches. 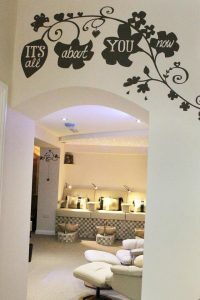 In addition to this we also have a lovely relaxation area, and luxury pedicure foot spa in a tranquil setting. We can also cater for the following: big hen do’s, bridal nights, princess parties for girls 7 years+, Staff Christmas Pamper Parties, birthday parties etc. in addition to this if you have any special requests please let us know and we can get this all arranged for you. We believe beauty is more than skin deep but ever changing lifestyles and the environment can affect the way it shows. As such we offer luxury spa brands for you to choose from. By using only the finest natural, mineral and organic products we offer you a personal and exclusive service. This enables us to give you the ultimate health and beauty experience. To provide the highest quality spa treatments that are affordable and reasonable. We have carefully selected our exclusive and luxury skincare ranges for their outstanding results and benefits. We are very passionate about all our services and treatments we provide. Our goal is to tailor the client’s services to their individual needs and help clients have a great outcome with any of their beauty concerns. You are our priority and our treatments will be delivered to you by passionate, caring, highly trained and knowledgeable therapists. We value feedback from clients during the treatments to ensure the client’s comfort and satisfaction and to increase repeat business. We are delighted to announce that we are a sister company to our multi award winning day Spa Vspa, the one and only local multi award winning spa, with latest awards won at the herald express tourism awards.